Canadian wine law is confused and confusing. Legislation is often out of touch with how wine is consumed and sold in the 21st century. Currently, one of the most contentious issues is interprovincial shipping of Canadian wine. The wine industry won a minor victory in 2012 when the federal government passed Bill C-311. This bill removed the federal prohibition on transporting wine across provincial borders. But the regulation of alcohol is provincial jurisdiction. In other words, Bill C-311 was largely symbolic, and could not compel provinces to act. To date, only British Columbia, Manitoba, and Nova Scotia have opened their borders to all Canadian wineries. Unbelievably, BC wineries can only legally ship wine to 23 percent of Canadians. Put simply, this is due to archaic legislation that dates to the period directly after the bootlegging era of Prohibition. You wouldn’t think twice about transporting most goods – clothes, jewellery – from one province to another. Free trade, perhaps now more than ever, is being debated. But free trade within the same country? That should be uncontroversial. Wine is the rare exception. That brings us to R. v. Comeau. 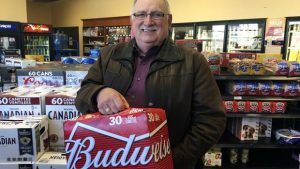 The facts of the case are relatively straightforward: Gerard Comeau was fined for transporting alcohol from Quebec to New Brunswick under the New Brunswick Liquor Act. 1 bottle of Stinger Premixxx liqueur, 1.4 litre. I’m not a lawyer, but to me this clearly suggests that alcohol produced in Canada can be sold and transported interprovincially. And, in this case, the New Brunswick Provincial Court agreed: the offending provision of the New Brunswick Liquor Act was struck down. This meant not only a victory for Comeau, but also that Canadian wineries, at least for the time being, can legally ship to New Brunswick. However, the case has been taken to the Supreme Court, where it will be heard on December 7, 2017. Comeau now has the potential to open interprovincial trade not just in New Brunswick, but all of Canada. This would be a major victory for Canadian wineries. Nevertheless, the Granholm decision did result in significant growth in direct-to-consumer sales. In 1996, direct purchases accounted for less than 20 percent of domestic wine sales. Today, in contrast, DTC is the dominant sales channel for domestic wineries, accounting for 59 percent of overall sales. Of course, there are other factors that impacted the rise of DTC sales – the consolidation of distributors, the emergence of online wine sales – but the Granholm decision set the stage by striking down protectionist state regulations. Which brings us back to Canada. The scope of the Comeau case may mean its legal impact is even greater than Granholm. The best possible outcome is interprovincial free trade with no barriers or limitations. According to a 2016 Senate report, eliminating all provincial trade barriers has the potential to add billions of dollars a year to the Canadian economy. Canadian wineries would then be able to legally ship wine to customers in any province. It’s not a secret that many wineries are shipping to “closed” provinces already. But the existing legal grey area undoubtedly discourages both consumers and couriers alike. This has the potential to change with Comeau. However, there is always the possibility of defeat, and that could result in a significant step backwards for the industry. If the Supreme Court upholds the protectionist policies of the New Brunswick Liquor Act, it may give provincial liquor boards the confidence to move away from the status quo and take a harder stance on out-of-province shipments. It’s not surprising that every province will be represented at trial. In other words, the stakes are high. It only seems fitting that during the 150th anniversary of the Constitution Act, 1867, the Supreme Court has the opportunity to uphold the principles for which it stands. The wine industry is ready and waiting. Want to show your support? Donations to the Canadian Constitution Foundation go towards supporting their representation of Gerard Comeau. The case is being argued, pro bono, by Ian Blue, QC.